Trying to properly put a harness on a dog always confuses me so much. Maybe it's just me, but for years I had the hardest time trying to correctly put on patients' harnesses when it was time for them to go home from the vet clinic. Actually, I don't think it was just me because it usually took two of us to figure it out. I know that for many dog parents, finding a dog harness that fits perfectly can be difficult. Shiner has a somewhat deep chest, so we come across this problem sometimes. Plus, the harness has to be comfortable for the dog too. We were recently asked to test out a Precision Fit Harness from My Canine Kids, Inc. The Precision Fit Harness is meant to be easily adjustable to your dog's shape and size. It's pretty darn stylish too and comes in a variety of different colors. Shiner picked out a pink harness, of course. I was worried that the harness might not fit Shiner, but that's how I always feel when trying out a new harness. Her new Precision Fit Harness fits perfectly, however. And I love how easy it is to put on her. It didn't take me very long to figure it out either. You can adjust the harness on the sides as well as with the velcro closure located on the top of the back. And what about this velcro? It's military quality for strength. It was able to withstand several vole and rabbit chasing attempts as well, so it's definitely strong. I'm not worried about Shiner coming out of her harness at all. My Canine Kids makes their Precision Fit Harnesses in 5 different sizes covering dogs from 4 to 50 pounds in weight. Shiner is right at that 50 pound mark. She could probably even grow into hers some more. Another thing I like about our new harness is the reflective lining on it. Perfect for walking at night for visibility. Something we currently do more often since it's so extremely hot outside right now. It's comfortable too! It has a wide chest area coverage which I like for when Shiner pulls on the leash. And she's willing to sleep in it as well, so it doesn't seem to bother her. 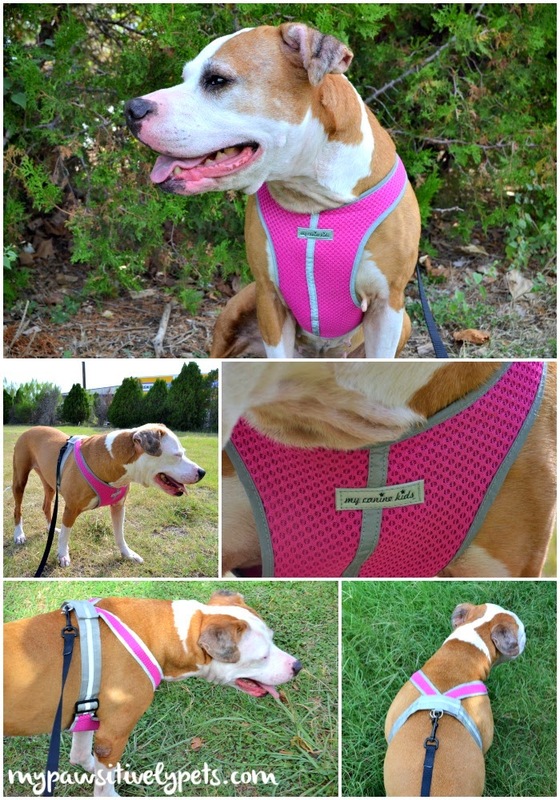 We give this harness 4 paws up for being easy to use, comfortable, and stylish. 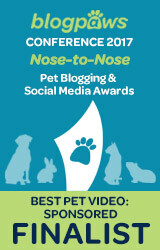 If you'd like to learn more about My Canine Kids, Inc. you can visit their website here. And to find where to purchase a Precision Fit Harness, here is a list of retailers. 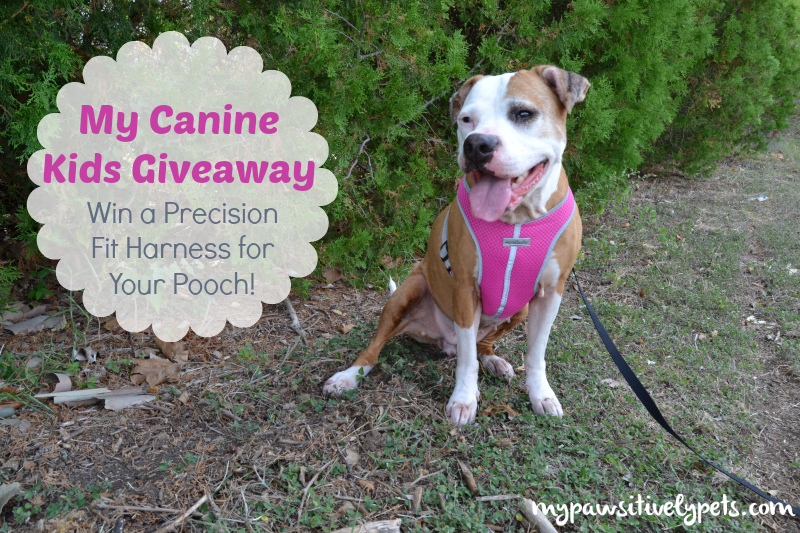 Win a Precision Fit Harness from My Canine Kids, Inc.
Want to win a Precision Fit Harness like Shiner's? 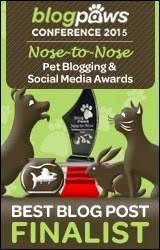 My Canine Kids, Inc. is graciously sponsoring a giveaway to our readers! One person will win a Precision Fit Harness in their choice of size and color. To enter the giveaway, simply fill out the Rafflecopter form below with as many entry options as you want to. This giveaway will end on September 1st at midnight CST. The giveaway is open to US residents ages 18+ only. Good luck! This review and giveaway is sponsored by My Canine Kids, Inc. Pawsitively Pets only shares information we feel is relevant to our readers and all opinions expressed here are our own! That looks a snug comfy fit on Shiner and love the pink and the reflective strips. Have a tremendous Thursday. That sure is a nice one and it looks wonderful on you Shiner! I love the harnesses I have from My Canine Kids. They are perfect for Roxy and Torrey. Shiner looks awesome in the pink! Yes - I remember their harnesses and think they look so cute in them! We love ours too! Love your blog. Funny! I've been looking at harnesses for my new little girl :) Thanks for this opportunity! Shiner looks beautiful in Pink! Shiner is rockin that harness! I love the look of this harness! It is beautiful! I would be worried about the Velcro though. My huskies pull like crazy! Oh, so does Shiner believe me. It's strong! 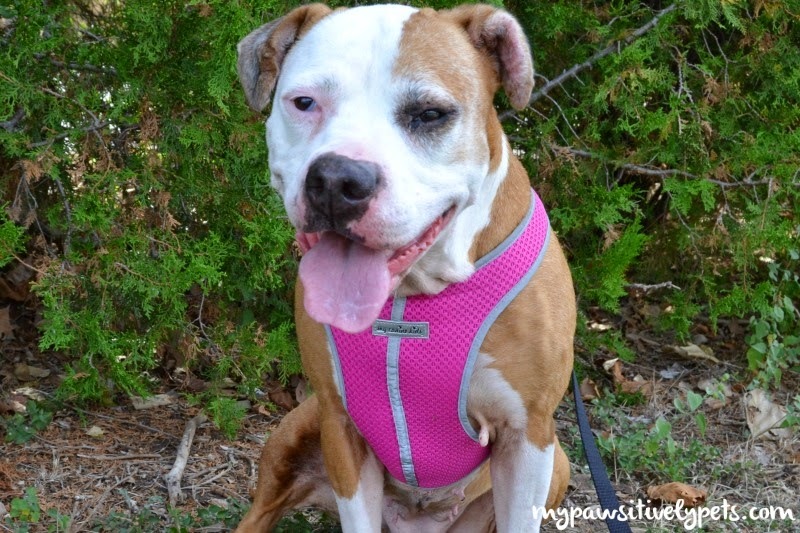 My Lulu would look stunning in the pink harness! I would like a blue harness for my little guy Gandolf. I like the red or blue for my Beauregard. Waffles The Wonder Canine says that she fancies the blue color. It does look like it fits really well, I love the reflective lining. And of course she chose pink; it looks great on her. I could easily see Laika rocking the pink as well. 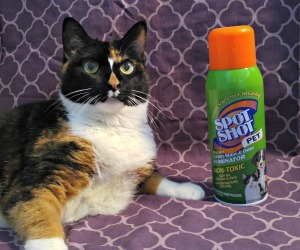 I just have to mention that the first time I visited your sight and saw a photo of lovely Shiner I didn't think twice about her name; the second time I can back I could see her left eye clearly in another photo and I actually laughed out loud. Haha! That is where she gets her name from! Harley doesn't wear a harness. If he did I would totally enter the giveaway. The pink is so fitting for Shiner. Looks really comfy too! I will alert all of Harley's "girls" about this post, perhaps they may want to enter. My dogs would love a red harness! Thank you! Looks real pretty on her! I am always on the lookout for good harnesses. All six use them. That looks very comfy! Thanks for sharing! I'd love the pink for Ruby. I don't use a harness with Bain, so hoping some lucky winner will get to enjoy this =) Great colour choice, Shiner! I liked the green that I saw! I think that would look pretty on Sheba, who needs a new harness! I would like a blue one for my doxie, thanks! So many options, it would be hard to choose which one I would want! Blue or red would be the way to go for me! Blue for either of my boys! Kouga would look great in the blue harness. Cute harness, very stylish! Does it help with pullers? Our dog is a puller especially during the first 10-15 minutes of her walk so I've been meaning to get her some kind of harness but with so many out there it's hard to choose one! I'm not really sure if it helps with pulling... it does seem like it wouldn't hurt them if they pulled though. It's durable enough for a puller though!